Review: When I think of good anime opening themes, I think not of songs like Kantai Collection‘s (KanColle) “Miiro”, but something more along the lines of “Fubuki”, which, interestingly enough, serves as KanColle‘s ending theme. 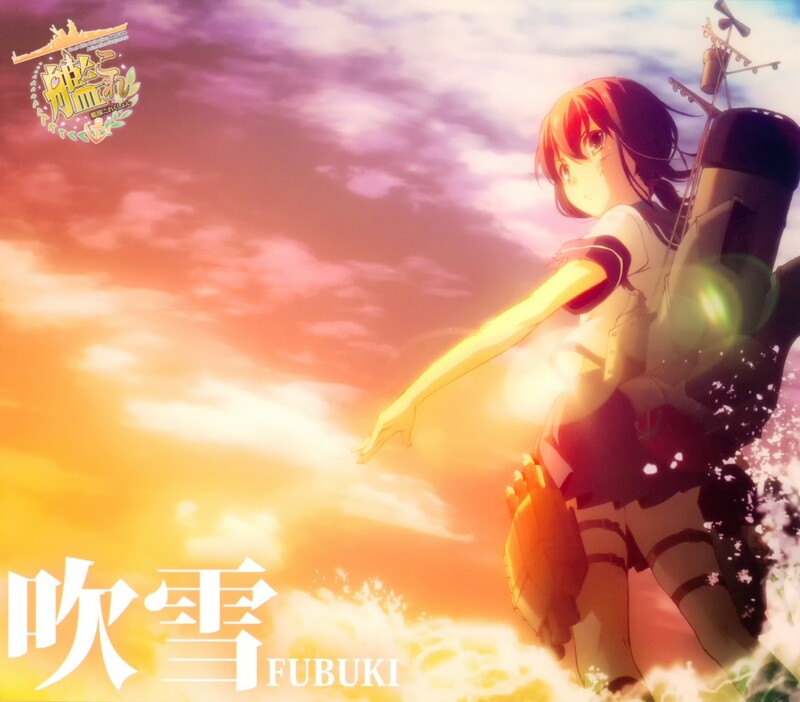 Indeed, “Fubuki” is practically out of its element since the song captures the earnestness of girls imbued with the spirits of naval vessels nicely, giving the whole anime a very strong first impression had it been chosen to be the intro. Where “Fubuki” succeeds is in the manner in which the characters’ thoughts and feelings materialize within the song. To start, newcomer Shiena Nishizawa’s delivery early on nails the characters’ aspirational sentiments through her soaring vocals. If that’s all the introduction contained, it’d be a good intro, but hardly noteworthy; the element that gives the song a bigger push is in the sudden shift that imparts the characters’ determination unto the audience. The first time I heard it, I was caught off guard by the ensuing lyrical flurry, but grew to appreciate how it makes the piece engaging and shows off Nishizawa’s ability to navigate those lyrics without flinching, thereby drawing my complete attention. And this attention is warranted because “Fubuki” meets the standard to be considered a competent anime theme. The song takes you into the stanzas where the music maintains its resolve and Nishizawa’s voice rings clear all the way through, with a strength that depicts the characters’ persistence and a delicateness that captures their desire to succeed in spite of the uncertainties. And when she reaches the chorus once more, Nishizawa radiates a tenacity that meshes with the characters’ convictions. Her delivery remains clear and firm as she speaks to the characters’ eagerness to see a brighter future with their friends and loved ones before finally bringing the piece to a resounding close. It’s in the B-side, “Meaning”, where things become more pedestrian as the song’s heavy rhythms makes way for a by-the-numbers pop song. The structure doesn’t deviate too much from the formula; the stanzas start out with an ebbing and flowing of delicate sections interspersed with more forceful ones before it makes the leap into the power-pop chorus. Nishizawa, to her credit, demonstrates her versatility in handling both delicate and forceful sections in this song with aplomb, even if the final result isn’t all too memorable. Taken as a whole, Shiena Nishizawa’s debut on “Fubuki” won’t turn many heads, but it does display her competence and versatility. This is especially important in a medium like anison where one song may require a more gentle touch and another may simply require imposing her will upon the listener with in-your-face power-pop. If nothing else, Nishizawa’s ability to modulate her voice will be a boon to her career as “Fubuki” shows that she can hold her own as an anison artist. Glad you liked the ending theme. Like I said previously, I really enjoy listening to it. I feel like every anime season there is one theme I end up listening to around 30-40 times in one week until I get absolutely sick of it and then take a break where I don’t listen to it for a month or two. This is one of those for me. I think this would also fall into one of the better theme songs from this season. It’s got a level of dynamism to it that I can appreciate quite a bit. With that said, there’s one song from this season which trumps it, and with luck, I’ll have it out sometime next week!